These graduated compression diabetic calf socks feature 8–15 mmHg graduated compression and comfortable, non-binding top to improve circulation. Soft, padded soles and low-profile seams protect from skin abrasions. Moisture-wicking fibers in these compression socks keep feet cool and dry to prevent blisters. 80% acrylic/12% lycra spandex/8% nylon. Machine wash. I am diabetic and need a comfortable compression sock. This is the first I have found that is worth wearing. The compression is perfect and with a larger calf, the sock fits well. I have purchased these for clse to a year and they do wonders on my calves!! Love them, will continue to buy these!! in the picture these stockings looked exactly like the ones I loved that lasted for years. But the material was not as soft feeling and while it said it fit a large calf my leg was swollen after surgery and after a day of wearing them became too tight on the legs. So washed them and will try and see how they do after i recover from the surgery. But they still feel harsh on my skin and not as soft as they looked but they were thicker than the usual one and that is what I wanted. I like over the calf compression socks and these will replace the ones i have had for over 10 years. I used the crew-length version of these socks for many years. I have 8 pair that are still in service. I am diabetic and need some more compression socks. friend is having swelling legs. Already own 4 or 5 pairs, and some need replacing, great for winter wear, very warm and comfortable. Getting new special boots and need knee high socks for diabetic. I have to wear over the calf stockings I like the looks of these, going to giv e them a try! Family member with poor circulation. Fit good for tall thin person, repeat purchase. They were ordered from my husband's doctor. I already have a pair and I love them! We're going to New Mexico and the Grand Canyon for this years holiday and I know these will work wonderfully with my boots! Looks like exactly what I need...calf length, compression and a diabetic sock. Love these - thick foot and good pressure around ankle! These look comfortable. Hope I like them. Love this - comfortable and provide all day support! My husband wears compression socks, and I wanted to give these a try. These are warm and comfortable in cooler weather. I have edema in both legs. They should help. I love this compression socks and never knew that you could get them in socks. I will always wear these so matter what. I love them and they keep my swelling down. I need compression for edema. The cushioned bottoms are a plus. My husband needs large socks that are not real tight on his legs, and he likes over the calf socks. will sock fit 19 "leg? What is the calf size on these socks? The size chart only shows shoe size, which does not let you know if they are going to fit around. 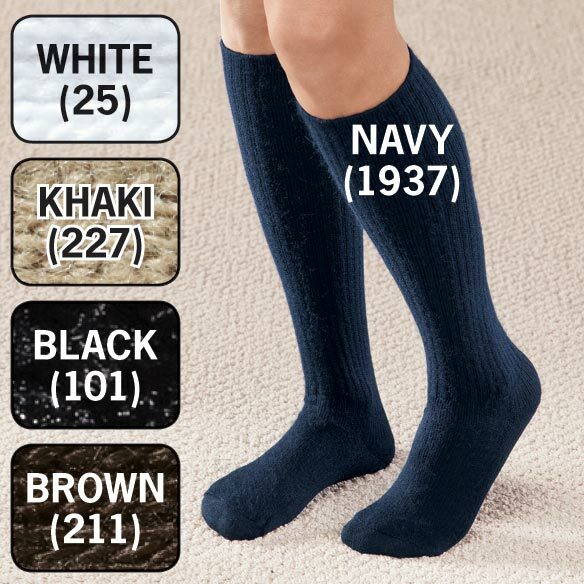 How tall is the calf length graduated sock? I am a fairly tall woman who usually has to order calf-length socks in a larger foot size just to get a higher calf height. However, this method usually means that the foot size is too big. Do you have a solution to the foot size vs. calf height dilemma? BEST ANSWER: Thank you for your question. You may consult the size chart located right next to the overview tab above the description of the item to help determine which size would be best for you. Also the compression sock from toe to the top of the sock is 22" and from ankle to the top of the sock is 12". We hope this information will be of help to you. do the socks have compression in the feet as well? BEST ANSWER: Thank you for your question. The compression is not in the foot. It starts in the ankle. We hope this information will be of help to you. BEST ANSWER: Thank you for your question. Yes the sizes are based on your shoe size. We hope this information will be of help to you. Do you carry over calf socks WITHOUT compression? BEST ANSWER: Thank you for your question. 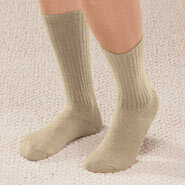 All we have are item number 346937, Diabetic Cold Weather Socks - 2 Pair. They are non-binding. We hope this information will be of help to you. Graduated Compression Diabetic Calf Sock. What is the compression in MMHg ? BEST ANSWER: Thank you for your question. Since there is no mmHg listed it is below 15 mmHg. We hope this information will be of help to you.